The two basic forms of playing golf are Match play and Stroke play. Apart from these two basic types of play, many other golf tournament formats exist, some of which are regarded “official” forms of play, such as Stableford and the popular forms of team play known as, Foursome and Four ball games. Other popular non-“official” forms of team play are Scramble (Texas scramble, Ambrose and Greensome. Further types of golf games include: Patsome, Skins, String, Chapman and Flag tournaments. Strokeplay is the most common form of competition at most professional tournaments. In stroke play, every player (or team) competes all 18 holes and counts the total number of strokes and the party with the lower total nett score (gross score minus handicap) wins. Players normally go out in threes or sometimes in twos, for example at professional events. In match play, two players (or two teams) play every hole as a separate contest against each other. The party with the lower score wins that hole, regardless of how many shots he won the hole by. If the scores of both players or teams are equal the hole is “halved” (drawn). The game is won by that party that wins more holes than the other. Matchplay is a very popular form of competition at club level. A foursome (defined in Rule 29 of the “Rules of Golf”) is played between two players in partnership, playing one ball which they hit alternately. One player tees off on the odd numbered holes, the other on the even holes, regardless of who played the last putt on the first hole. The other shots are played in turns until the hole is finished. Penalty shots do not affect the order of play. Foursomes can be played under match play or stroke play rules. Variations on foursome are Greensome, Canadian foursome and Mixed Foursome, in which two teams of a male and female golfer playing alternate shots. In Canadian foursome each player plays his/her own ball from the tee and the players then decide together which ball is in the best position and the other ball is taken out of play. For Greensome see further. The same as foursomes but each player plays with his own ball and the better score of the team counts. Four-balls can be played as match play or stroke play. (Defined by rules 30 and 31). In a Three-Ball match, three players play against one another, each thus playing two distinct matches. A slightly different form is Best-Ball, in which one player plays against the better ball of two or the best ball of three players. The winner is the player who scores the highest number of points. The scoring for bogey and par competitions is made as in match play. Any hole for which a player makes no return is regarded as a loss. The winner is the player who is most successful in the aggregate of holes. Each player in a team (of two, three or four players) tees off on each hole and the players decide which shot was best. 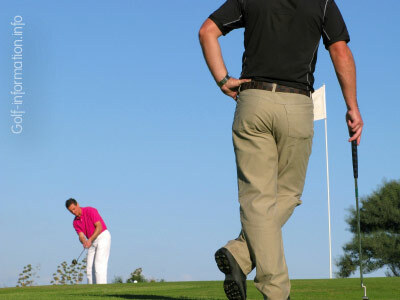 Other players then picks up their ball and play their second shot from that position and the procedure is repeated until the hole is finished. The lifted balls must be placed within one scorecard’s width of the selected position. If on the green, the balls are to be placed within one putter head of the marker. This type of competition is popular with golf societies. An Ambrose is the same as a Scramble, but in an Ambrose handicaps are used in the game, as in strokeplay. The net score is the total gross score minus the adjusted handicap. The adjusted or team handicap is calculated by dividing the total of all handicaps of a team by two times the number of players in a team, so 1/8 of the aggregate for a 4-person team, 1/6 of the aggregate for a 3-person team and 1/4 of the aggregate for a 2-person team. Texas Scramble is a variation in which both individual play and team play are rewarded as a set number of drives of each member of the team must be used during the course of the round. If a beginner golfer is part of the team it may be wise to use their drives early in the round so as to take the pressure off them for the rest of the game. Type of match play game in which each hole is worth a given amount of points or money, which you can win only by winning the hole outright. If the best score for the hole is achieved by more than one player the mony or points are carried over to the next hole, making all subsequent holes potentially worth considerably more. In the event that two or more golfers halve the final hole, a playoff begins until one golfer wins a hole outright. There is an annual skins game for male professional golfers which takes place in November and December each year after the end of the official PGA Tour season. Only four golfers are invited to the tournament. It is recognised by the PGA TOUR but does not count towards the official money list. It is currently sponsored by Merrill Lynch and is officially known as the Merrill Lynch Skins Game. A variation of Foursome where both teammates of each team make a tee shot and each team selects which one they prefer. The player whose ball was not selected, then plays the second shot and all future even-numbered shots on this hole, the other teammate playing all further odd-numbered shots. The six first holes are played in Four-ball, the next six in Greensome and the last six in Foursome. The final count of strokes is calculated as in Foursome. A variation of Four Ball where each player hits a tee shot and swap positions to hit the second ball (each player of the same team hit their teammate’s ball), whereafter they decide which of the two balls they choose to play for the remainder of the hole. The other ball is picked up. Once the best position is selected, the teammates alternate strokes until holing out. Also called “Pinehurst”. Each player gets a length of string that they can use to improve bad lies. The length of the string depends on the player’s handicap (generally 50cm per handicap point).When in a bad lie the player cuts off the length of string equal to the distance they move the ball(without penalty) to any new position away from where the ball had previously come to rest. Once the ball is moved, that length of string is no longer available. Each player may use his string at any time during the round to save as many strokes as possible. Each player is given a small flag and is allocated a number of strokes equal to par plus 2/3 of his handicap. When the player runs out of strokes he plants his flag where the ball lands. The player who gets the furthest wins. 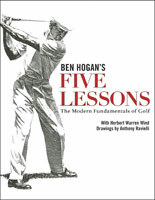 Golf-information.info is the ultimate informational resource for everything golf, with a unique approach where the focus is not just on improving your technique, but where golf tips are based on five axes that make up the game of golf. Golf-information.info also provides extensive background information about the origins of golf, the etiquette and the rules, which are all essential to get a better understanding of the game. Golf-information.INFO © 2005-2016. All rights reserved.